My husband and I talked about our favorite places throughout the country that we would want to live in last night and after seeing this beauty, Georgia is being added to my list. Well, Savannah is already on my short list (for the states) but still ... isn't this home dreamy! Couple this with some southern hospitality, dripping trees, and some fresh peach pie and I'm there. What about you? Have you ever daydreamed about places around the country/world you would live? What are your top three? I would love to hear about them. This home is owned by Derek & Carolyn Lowe, Derek plays for the Atlanta Braves. It is designed by architect D. Stanley Dixon and designer Betty Burgess and shared in Atlanta Homes & Lifestyles. Photos are by Erica George Dines. See more photos here. oh my gosh!! i love this normandy style house! one day i would like to have one (maybe a smaller version though). i love the kitchen and that pool...so pretty! love that atlanta is now on your short list. we live here and love it! Well, this just made me homesick! I'm originally from Atlanta, though I have to admit that if I had to choose somewhere to live that it would probably be right where we are in Copenhagen. Next on my list would be Spain again or maybe Seattle in the States. in the blog world we get to see all of homes and interior more than if there was only magazines and although many of them i like one room or the other- this is by far the most beautiful house. honestly this house should have copyrights! What a gorgeous place. Thank you for sharing it so beautifully! the house is absolutely beautiful. I want to live in a house on the Spanish island Mallorca. 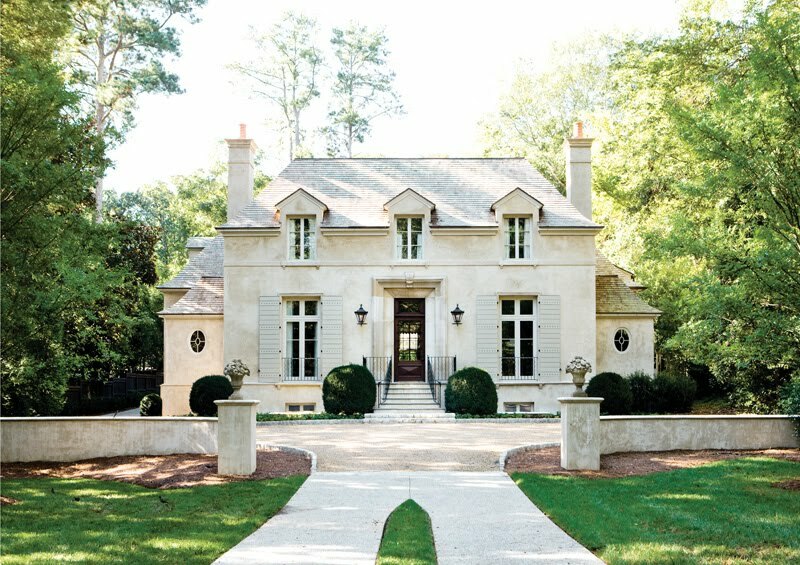 I never in a million years thought I'd be living in Georgia but when we got the opportunity to move to Atlanta this year, the first thing that persuaded me to say yes were all the gorgeous homes I saw. It's heaven here if you love houses and architecture! are portland oregon, provo utah, or my hometown of boulder colorado. very nice! i love the bar stools in that kitchen. i left the US several years ago and now that i've moved a abroad once, i totally have the itch to keep roaming. Spectacular! I imagine most athletes living in a McMansion, but this home is so chic! those light fixtures in the kitchen. that kitchen, period. gorgeous. Gah! This is so beautiful! I want to live in the Northwest or Northeast. I grew up in New England so that would be ideal. Or you know, Tuscany would do. Haha. So freakin' gorgeous. I love the softness of the gray color palette and how that orange/red pops out in such a delightful way. I've never been to Georgia, but have always wanted to go. The homes are just incredible there. I imagine it's something of a design lover's paradise. Savannah's on my shortlist, too, and I've always had a soft spot for little beachy towns, like Cape May and Wilmington. I don't live very far from it, but Charlottesville is one of my fantasy future homes, too. I don't know much about Savannah, but I've always wanted to go there! It seems very southern gothic and very romantic! One of my favorite places is Monterey. I spent a summer there in college studying marine biology, and I have so many happy memories associated with it! such an amazing house!! I wouldn't mind living in it!! mmm yeah I posted that kitchen on my blog a while back, I WANT. a little too imposing for me. My favorite places to live include Washington (around Seattle) and Maine. Maybe North Carolina third. wonderful house. We want to life in America or in Italy (Lake Garda) in a Mediterranean house with a little pool and a view of the lake and the mountains. 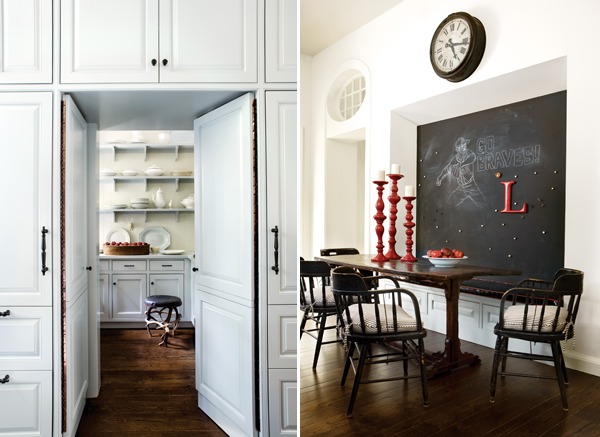 the kitchen in that home is worth moving all together! i need to visit georgia one of these days and see these beautiful designs in person. oops! i linked to a poster i was just admiring! haha. Wow I feel right at home in this comments list...so many people were saying the same thing I was feeling. As an American expat, I too feel like once you leave your home, you feel like you could go anywhere. I currently live in London and still love/dream about it. Additional places on the list would be in France (Paris or just ouside, Fontainebleau?) ...or Massachusetts...or Rome...or Portland. Wow...that's a random list. Nice to have options I guess! Went to Savannah for the first time this summer, and loved it....it is VERY beautiful there and this house fits the bill! The kitchen is amazing. wow - that house is stunning - yeah, I could probably live in Georgia!! I'm so in love with those black and red stools! that's a very dreamy home, i would love to have a home like that.. if i were to live in the US, i would like to have a brownstone flat in new york, or a second empire house in boston or maybe a victorian home in san fransisco. i love those kinds of houses!